The buil­dup of the Air Force play­ed a major role in the rear­ma­ment poli­cy of the NS regime. For this rea­son air war­fa­re schools were requi­red. Thus the Deut­sche Luftverkehrs‐ und Han­dels­ak­ti­en­ge­sell­schaft (Del­hag) star­ted purcha­sing pro­per­ties south of the rail­way line Munich‐Augsburg from 1934 in order to set up an air­field wit­hin the distric­ts of Mai­sach and Fürs­ten­feld­bruck. While far­mers from Mai­sach and Fürs­ten­feld­bruck pro­tested against the expro­pria­ti­on of their pro­per­ties, their loca­ti­on appealed to the aut­ho­ri­ties as it was both situa­ted in the open coun­try­si­de as well as clo­se to arma­ment cen­ters. The plan­ned air war­fa­re school in Fürs­ten­feld­bruck was con­si­de­red a mili­ta­ry object of pres­ti­ge in Bava­ria. Dr. Ernst Sage­biel, minis­try offi­ci­al, was invol­ved in plan­ning the rep­re­sen­ta­tio­nal buil­dings for the emer­ging air base. Robert Rosko­then was respon­si­ble for site and plan­ning super­vi­si­on as well as for the tea­ching and accom­mo­da­ti­on faci­li­ties. From a Natio­nal Socia­list Air Force per­spec­tive, inde­pen­dence of infra­st­ruc­tu­re was impe­ra­ti­ve when set­ting up air war­fa­re schools. This inclu­ded their own water and ener­gy sup­ply, a cor­re­spon­ding access to the road and rail­way net­work as well as their own main­ten­an­ce and repair faci­li­ties. A num­ber of han­gars and a lar­ge armo­ry were built for the ope­ra­ti­on of flights. The “Kilo­me­ter­bau” (“kilometer‐building”) ser­ved as living quar­ters for mili­ta­ry per­son­nel. The array of the buil­dings aimed at a spe­cial “vil­la­ge cha­rac­ter”, which was sup­po­sed to pro­vi­de bet­ter camou­fla­ge. A mas­si­ve gate‐tower with a poin­ted gab­le and a tri­par­ti­te arched pas­sa­ge was built, through which one could get to the actu­al air war­fa­re school, an amp­le three‐wing com­po­und sur­roun­ding the para­de ground. Here, the commander’s office, the audi­to­ri­um as well as the accom­mo­da­ti­on are­as were grou­ped tog­e­ther. On 1st Octo­ber 1937, the air war­fa­re school was ope­ned. An area of approx. 400,000 squa­re meters of forest was clea­red by approx. 1,800 to 2,000 workers and eight kilo­me­ters of roads and 5,000 meters of rail­roads were built. During that time, the air base was the district’s lar­gest employ­er. In addi­ti­on to that, craft busi­nes­ses and con­struc­tion com­pa­nies in Fürs­ten­feld­bruck bene­fi­ted from orders rela­ting to the set‐up of the air base. Howe­ver, the site was not com­ple­ted by the end of the war. By March 1940, some 24 mil­li­on Reichs­mark had been spent on con­struc­tion. The Fürs­ten­feld air base ser­ves as a good examp­le for the major efforts the Natio­nal Socia­lists put into the con­struc­tion of air­fields in Ger­ma­ny. The trai­ning of a new genera­ti­on of offi­cers and young air force pilots, in par­ti­cu­lar, was orga­ni­zed at the air base. During the Natio­nal Socia­list peri­od, the air base remai­ned a trai­ning cen­ter. World War II did not lea­ve the Fürs­ten­feld­bruck site unsca­thed. In the peri­od from Novem­ber 1939 until Octo­ber 1940, the head­quar­ters of the air base were relo­ca­ted to Neu­hau­sen near Königs­berg. In order to ensu­re the ope­ra­ti­on of Me 410 fast bom­bers the air base recei­ved a paved run­way in 1943, which was exten­ded to 1,500 meters in 1944. Com­bat units, howe­ver, were not sta­tio­ned here. In 1942, the ratio­ning of fuel affec­ted the trai­ning ope­ra­ti­ons of the school to the extent that the num­ber of fly­ing les­sons had to be curtail­ed for the first time. This deve­lop­ment even took a turn for the wor­se as time went on. In an attempt to make up for can­cel­led trai­ning time, gli­der flight trai­ning was inten­si­fied. This resul­ted in a gre­at num­ber of inex­pe­ri­en­ced and insuf­fi­ci­ent­ly trai­ned pilots joi­ning the com­bat units. Pilots trai­ned at Fürs­ten­feld­bruck air base were deploy­ed to com­bat war zones all over Euro­pe. On 9th April 1945, the air base was bom­bed for the first and only time. During the Natio­nal Socia­list peri­od, the com­man­ders at the air base were: Her­mann Rit­ter von Mann Edler von Tiech­ler (from Octo­ber 1937 to March 1940), Her­bert Son­nen­burg (from Octo­ber 1940 to Sep­tem­ber 1943) and Otto Höhe (until the end of the war). The admi­nis­tra­ti­on of the town and the air base sha­red a com­mon inte­rest in a num­ber of issu­es. A signi­fi­cant increa­se in demand for housing occur­red in the sur­roun­ding area. The rela­ti­ons­hip bet­ween tho­se respon­si­ble in the army and the Natio­nal Socia­list par­ty was said to have gene­ral­ly been posi­ti­ve; they col­la­bo­ra­ted from the begin­ning. 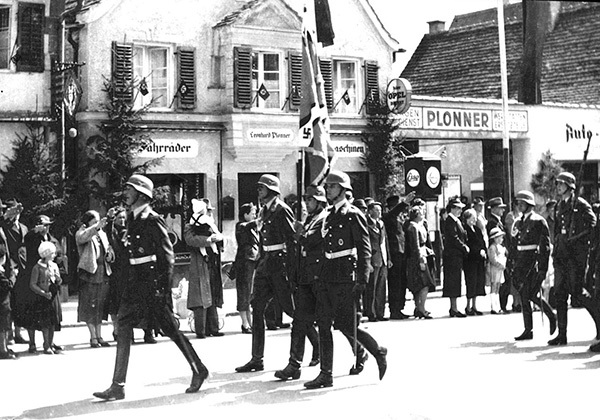 The first com­man­der of the gar­ri­son, Major Frei­herr von Beaulieu‐Marconay, took the salu­te at the march‐past with Kreis­lei­ter (district lea­der) Franz Emmer, Mayor Adolf Scho­rer, Orts­grup­pen­lei­ter (local par­ty group lea­der) Hein­rich Böck and Kreis­amts­lei­ter (district admi­nis­tra­ti­on lea­der) Eugen Scheu­rer for the first time in April 1937. Many events such as music per­for­man­ces, sight­see­ing flights and pre­sen­ta­ti­ons of films, wea­pons and com­bats were made avail­ab­le to the public. In addi­ti­on, hund­reds of civi­li­ans were employ­ed at the air base.